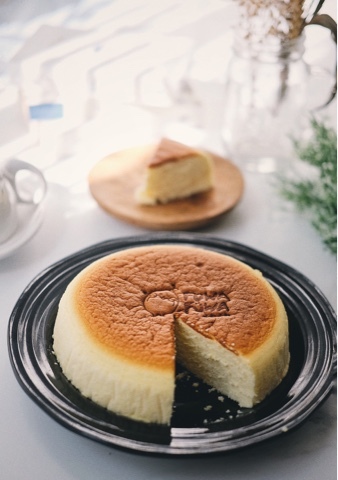 Japanese Cheesecake is commonly you can correlate with something tasty with delicate dense cheese flavor. Sometimes eating that kind of cheesecake make me guilty, making me want avoid it especially during my healthy-diet time. 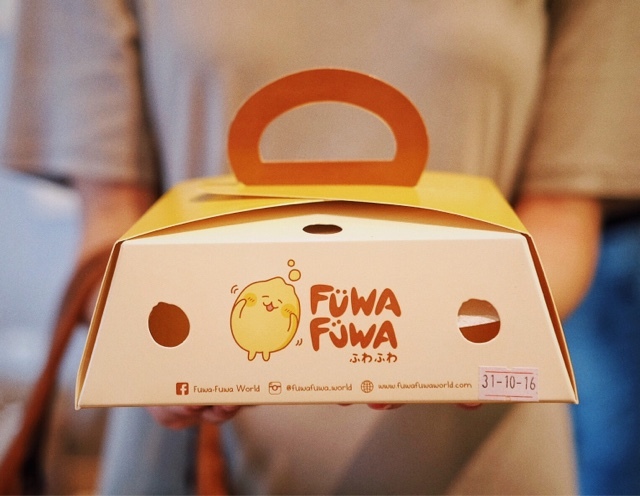 Good thing is, Fuwa-Fuwa delivers Japanese cheesecake that is so fluffy and airy, like the definition of Fuwa-Fuwa itself: something light and fluffy. 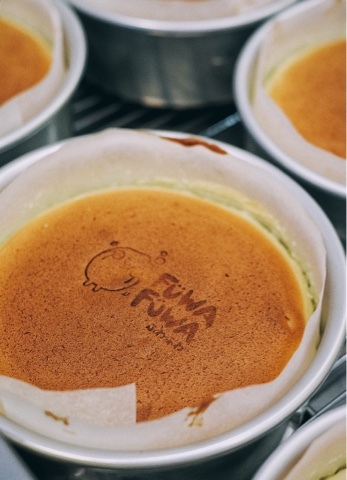 Freshest ingredients, modern baking technique, turning all those things through the magic of Fuwa-Fuwa, creates one good fluffy cheesecake. Yes, they're the first one who bring the fluffy cheesecake to Indonesia. It's like melting yourself in a bunch of cloud, they said. I do understand their concept that with their fluffiness, this kind of cheesecake is really enjoyable even for parents and children. You can really share it with all of your loved ones! Can't get any cuter. Love love the design of the box: make me can't wait to taste the fluffiness! I did pay a visit to their first store at Elang Laut, Pantai Indah Kapuk area. Their store do not have a dine in area, just a take-away store so you can enjoy it later. 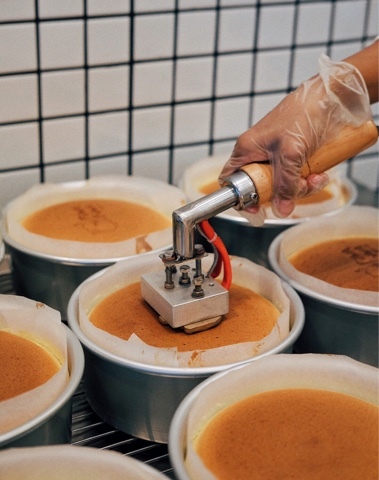 The good aroma of baked cheesecake was dominating the room, giving me this soothing atmosphere and thought that it had to be good! 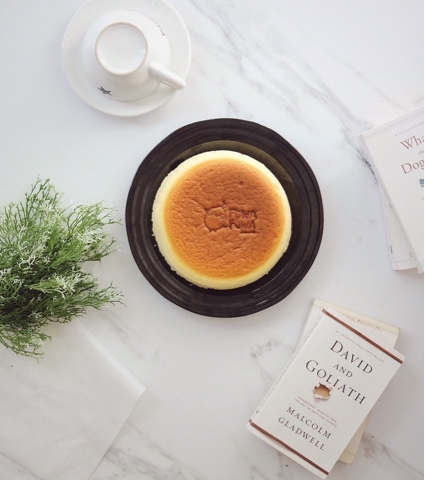 Baked cheesecake was set on displayed, giving us the attraction of this fluffy cheesecake when it was being stamped. They have original/signature, matcha, and chocolate flavors. It was so jiggly I was gonna die! Anway, it was so crowded on their soft launching day. People really wanted and got curious about the goodness they offer. A mixture of cookies made of cheese, chocolate, and matcha. The packaging is so cute and I think it's a perfect gift for kids. These different flavors really have their goodness in their own way. 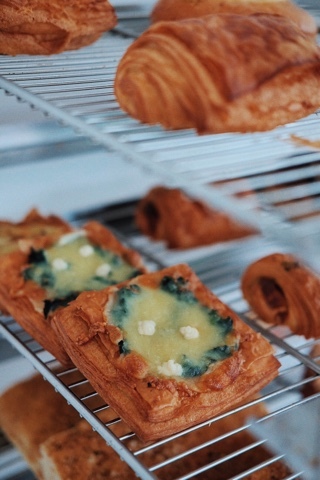 The cheese one is so good that melted in your mouth right away after you take a bite, but the chocolate and matcha have stronger flavors. I can't decide which one is my favorite, I just can't stop eating them! 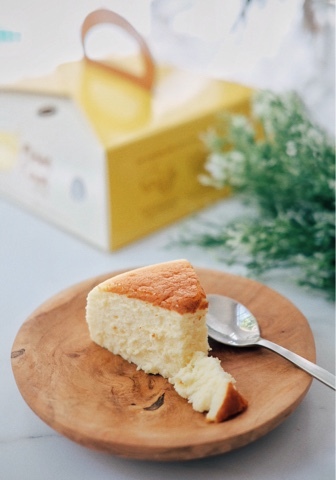 While I find myself want to have something more dense and cheese, I have my Fuwa-fuwa cheesecake chilled on the fridge before I take a bite. Turns out I am a happy kid enjoying one fluffy and dense cheesecake. The cheese flavors is really enhanced when it chilled. I really recommend to enjoy it this way! They do not use any preservatives. Last for 12 hours in room temperature and 2 days in fridge. 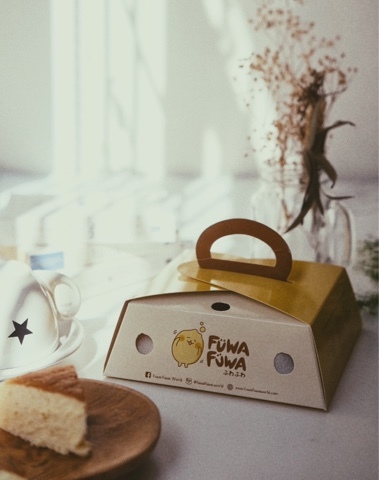 Better hurry to dig in your Fuwa-fuwa cheesecake! 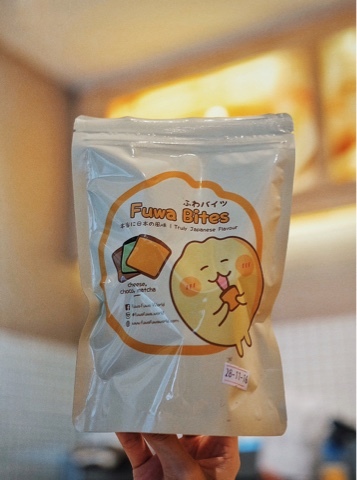 Overall I really satisfied with what I got from Fuwa-fuwa. Cute concept. fluffy and airy cheesecake, perfect for all family members in all occasions. By typing this I am drooling myself right now and can't wait to give myself a treat of their cheesecake. Anyway, they're gonna open at Central Park Mal, soon! Best of luck for you, Fuwa-Fuwa! 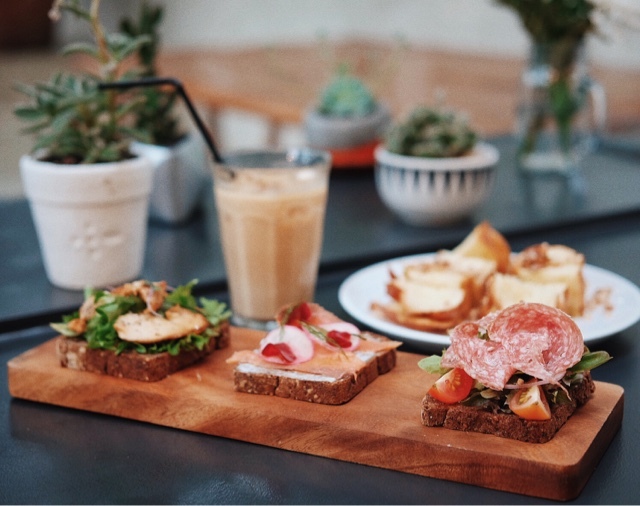 Coffee shop nowadays is identical with something rustic, minimalist, greyish, wooden dominated, and stuff. 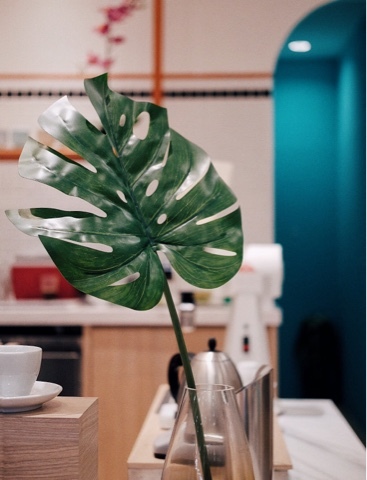 Can't agree more, those concept of coffee shop make them pretty, instagenic, a perfect spot to shot your OOTD or just your caffeine boost of the day. This coffee shop, on the other hand, has its candy house concept with fun bright colors: Oetara Coffee. Nope, I do not know what they real concept is, the candy house stuff is my personal opinion. 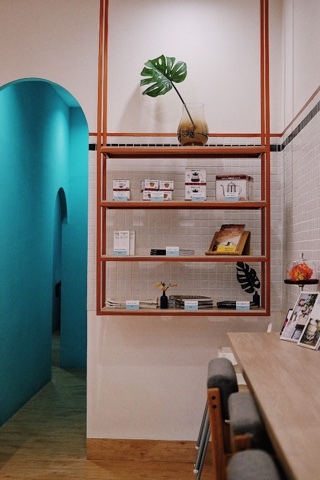 Fun tosca walls are dominating, while the iconic tosca window is one unique twist for this coffee shop. The rest of it is covered with wooden wallpaper, how I wish they use a real one though, to beautify its pretty place. Place is spacious, separated into indoor and outdoor area. 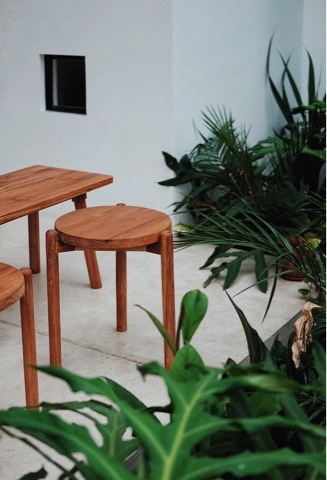 I won't mind to sit outside during this rainy season though, since the weather is so friendly, but I don't think the heat of usual Pluit weather would be a perfect companion for a-non-airconed space. 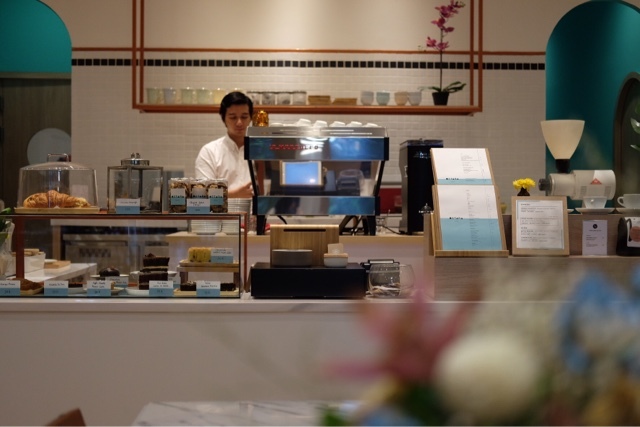 The barista is former headbar for Chye Seng Huat Coffee in Singapore, they said. 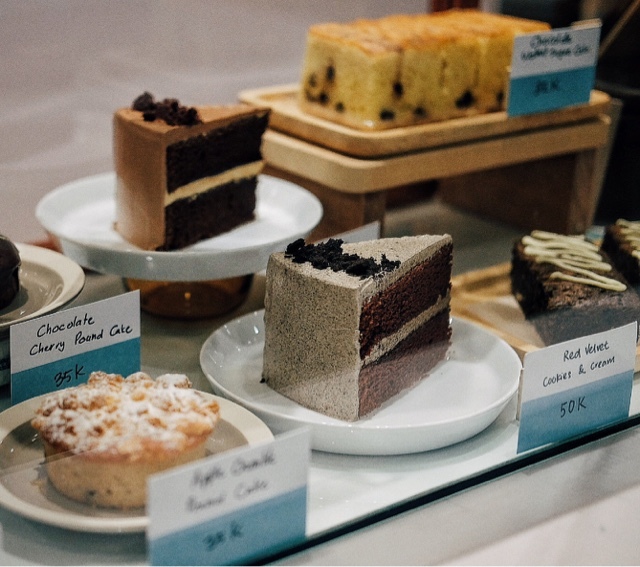 Lotsa cakes: apple crumble, tarts, kouign amman, they have it all. 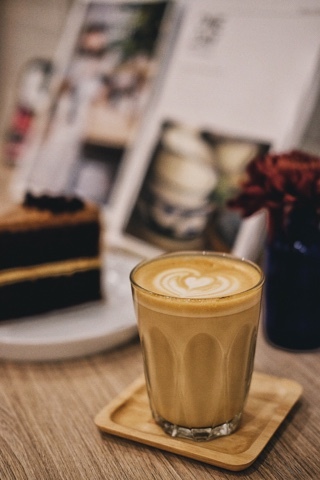 One of their speciality: hot coconut latte. They only serve it in hot because the coconut is not a good match to be paired with ice drinks somehow. This one is good! 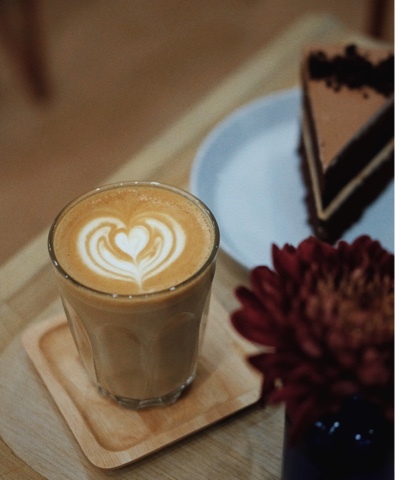 Good presentation, taste of latte is on point with a twist of coconut inside. I like it how the coconut really blend well with the coffee, giving it a kick to my caffeine. I also have their hot latte and hot capp. They already reminded me that their latte is a bit thinner because they are using bigger cup, and yes it is so light. I prefer the heavier kind of latte, tbh. Their capp is fine, though. 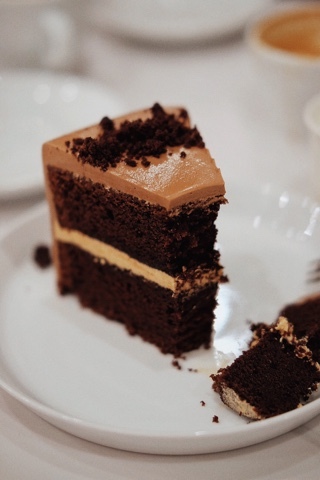 Their recommendation to pair my milky coffee with a slice of chocolate cake, to neutralize the texture. This cake is not bad, but I find it's to sweet on my palate, even for my brother's who is a fan of sweet tooth. Texture is fine, portion is quite big, but still, 50k for a slice of cake is quite pricey. 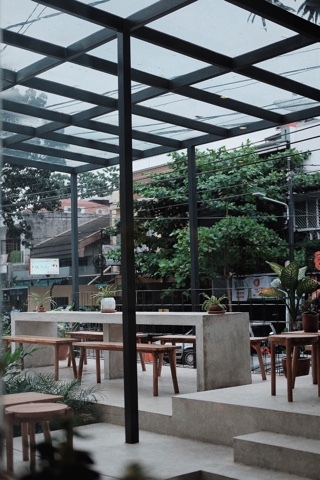 Overall Oetara is an exciting addition to coffee shops in North Jakarta. 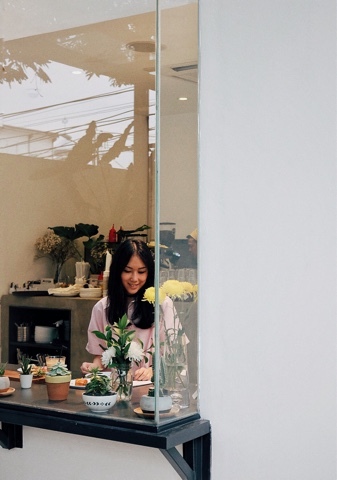 Super friendly staffs with comfy place and not-bad coffee, it can be your next spot for afternoon chit chat. Talking about chocolate, this happy pill is surely one of the addicting substance that can really boost your day. 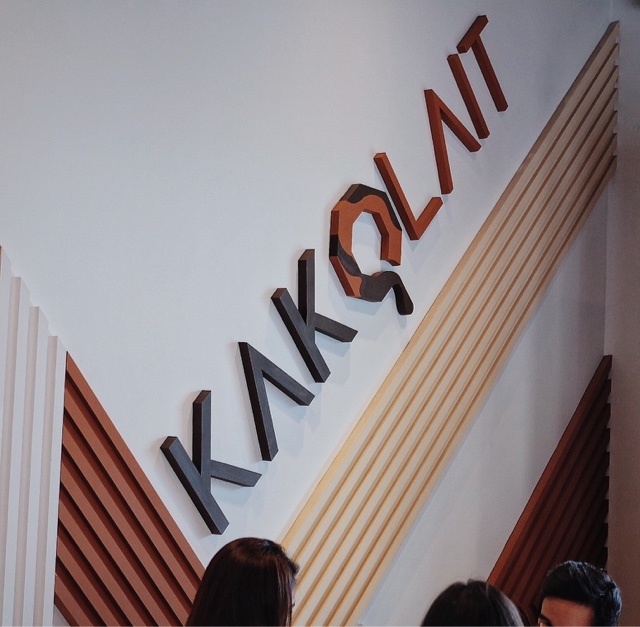 Kakolait, as the first ever chocolate cafe in Gading Serpong, is here to spread the happiness. I knew they were going to open it since long several months ago, and I knew instantly that this kind of cafe could really make a hit. Kakolait, stands humbly in Gading Serpong area, aligned with Turning Point, Daily Press, Torigen, and Porto. The place where all those good foods reside, I can say. Kakolait is decorated with its brown decoration, homey atmosphere, make me wanna sit there to spend the day, drowning with my favorite books. For now they only have their first floor open for public, but soon they're gonna expanding to the second floor! 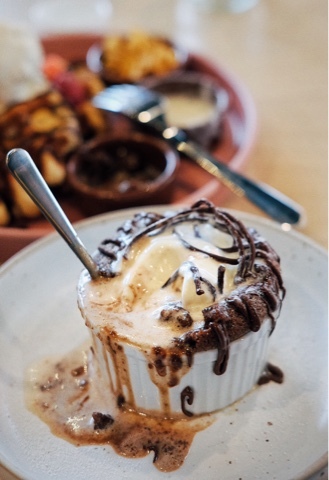 Lava cake, hot chocolate, waffles, they have it all. I just can't wait to try all those goodness! Ps: I can imagine myself to have my hot chocolate, wearing my favorite sweater, and treat myself a good book here. Hot chocolate is one thing you have to try here. They have it in two ways: milk or dark. Me? Go for dark chocolate, for sure! 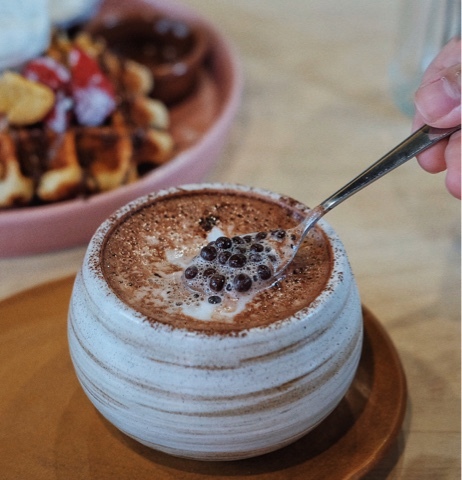 I like the dense hot chocolate topped with the crunchy waffle balls. Giving it a twist while you're taking a sip of it. 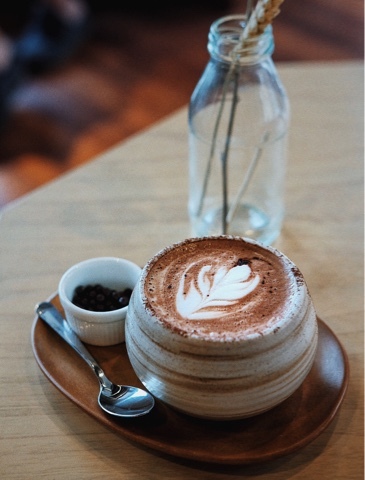 Their hot chocolate is surely one perfect companion in this rainy weather. This is,my friend, is one thing you do not wanna miss in Kakolait. 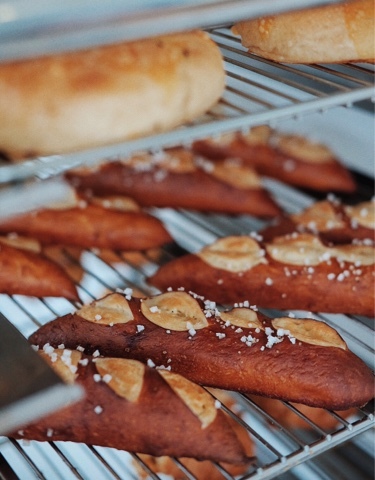 Their kokolava may be looked simple, but surely it will give you a big smile, ear to ear, after your first bite. 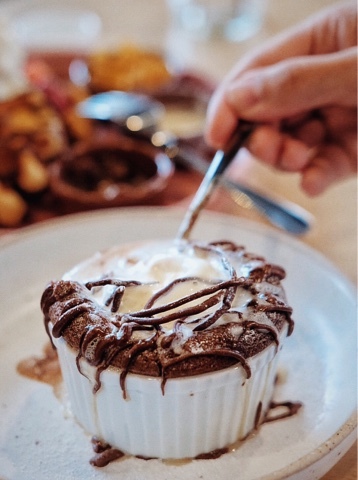 Dense warm chocolate, with dark gooey chocolate filling, topped with vanilla ice cream. I really love the consistency of their chocolate filling, messy messy good! 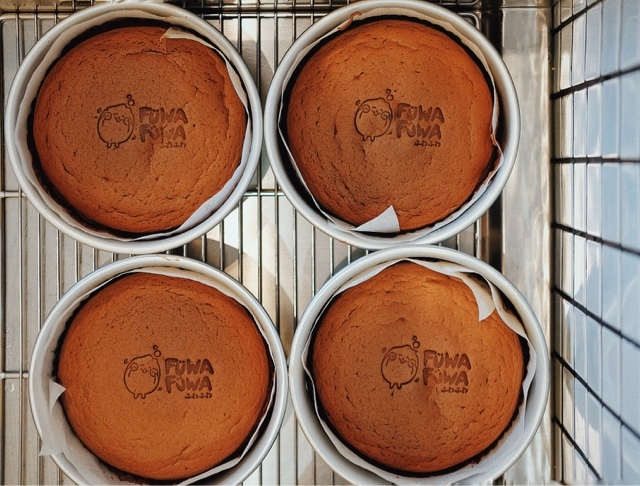 Hint: drink your hot chocolate first before taking a bite of this kokolava goodness. Comparing two of these goodness, the chocolate drink may be 'thinner' than this kokolava. 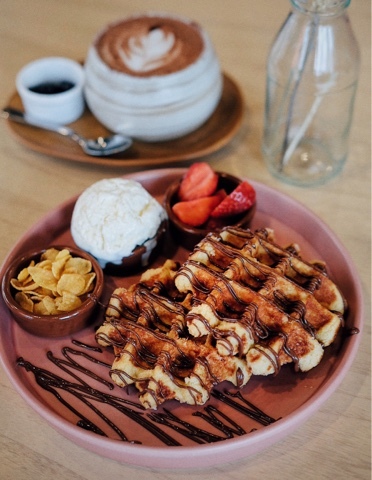 Inspired by heavenly waffles of Max Brenner, Kakolait are here to offer us the same goodness Max B has. 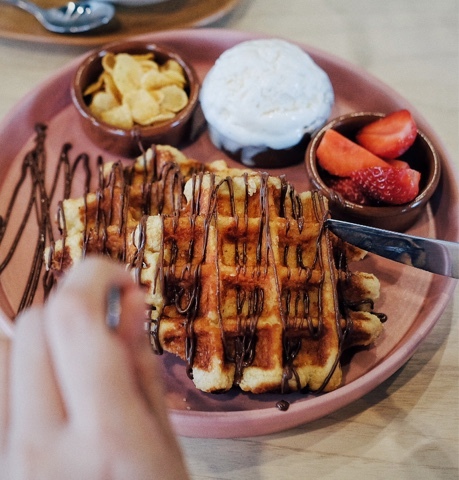 The waffle is slightly denser than any waffles I had before in Jakarta, and as a waffle freak I do not mind at all. Perfect level of sweetness, while I find that their waffle consistency is more cakey. 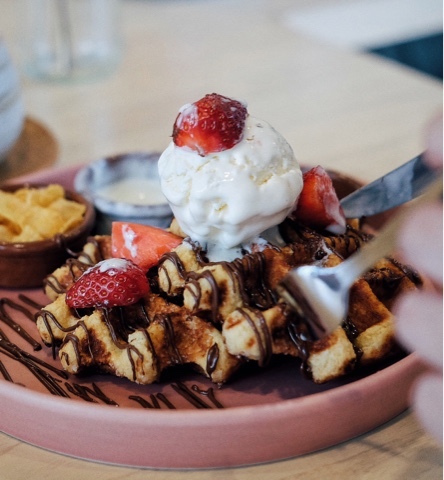 Some of you may find this waffle is too heavy, so I do recommend to share the portion. 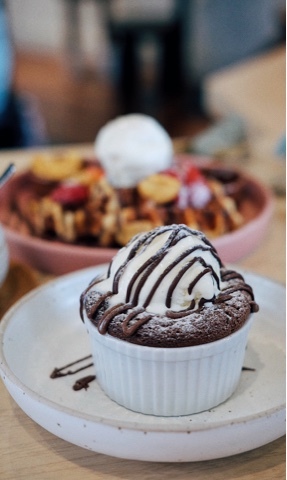 They're also planning to launch their airy waffle, soon! All of these sweetness may kill you (happily), but worry not because they have this red granita to neutralize it! Basically it's a mixture of dragon fruits and lychee: refreshing, cold, and sweet! Overall I am so impressed with Kakolait. Strong concept, proper chocolate drinks and sweets. I really enjoyed everything I have in Kakolait. 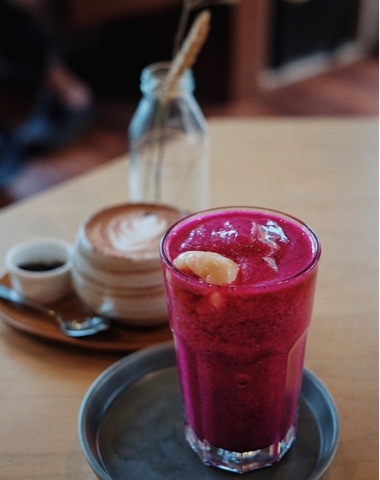 They also serve coffee and juices, for those who want to try something else. But well, you really should have chocolate based stuffs when you're on chocolate cafe, right? There are days I am craving for humble Indonesian food, there is another day I do crave for fancy Japanese dishes. I do have some favorites of Japanese restaurant in Jakarta, most of them is the authentic one. I do not really into those fusion sushi with lotsa mayonnaise and toppings, I am just happy with fresh sushi, good Japanese rice, and tasty Japanese grill. Finding Kazoku Tei is quite surprising for me, since I do not have any expectation on discover one Japanese restaurant here in Sukabumi city. I heard some local reviews, which was a recommended one, because Kazoku Tei was the only destination for their Japanese craving. I also asked for my friends from Jakarta, and they said this humble Japanese restaurant was not bad at all. Kazoku Tei is located on the road heading to Sela Bintana, seated across Balcony Hotel (read my review about Balcony here). It's a humble Japanese food, delivering a good homey ambiance. To my surprise, place is quite spacious with garden area behind the building. I had my visit at night and the atmosphere is comforting enough. The menu is quite vary, giving me quite a hard time to decide what to order. 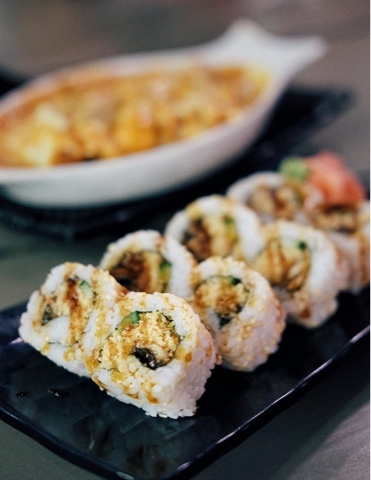 Omu rice, bento, ramen , udon, sushi roll, they have it all. I have a good feeling this one could be a proper Japanese food. Yes, they have Mozaru, like the one I have in Zenbu, Jakarta. I have chicken mozaru with curry rice, and it is not bad at all. 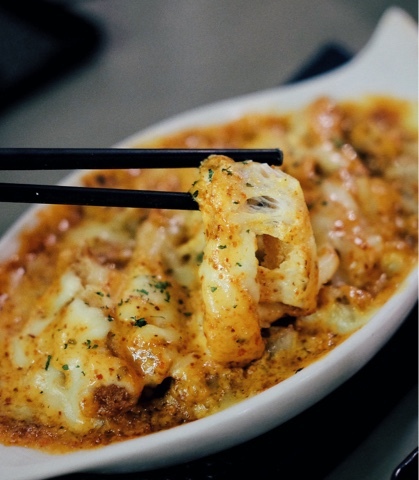 The presentation is appetizing, curry rice is tasty and fragrant, while the chicken and cheese is quite generous. Portion wise, it's fulfilling for me. I have to say this is one proper mozaru, not that kind of any ordinary baked rice. hey have many selections of sushi and I picked unagi roll because I was craving for it. Eight pieces of sushi, with unagi/eel, crunch, and cucumber inside. To be honest it is a bit dry, but the filling is quite enhancing the flavors. More teriyaki sauce is needed to make it more flavorful, perhaps? Having one bowl of warm chicken katsu don is one of my favorite moment, especially when I am so hungry. 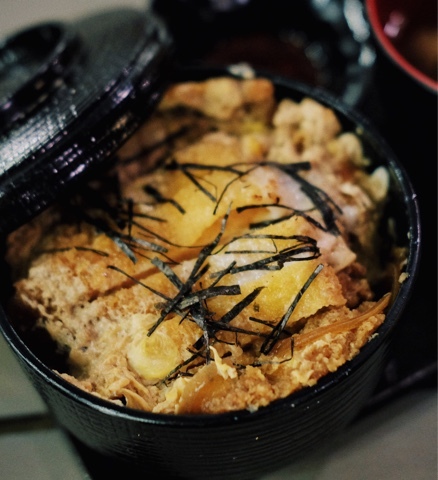 Japanese donburi is one simple dish that always been a comforting one for me, because in that humble dish, you can really enjoy the goodness of rice with delicious toppings. 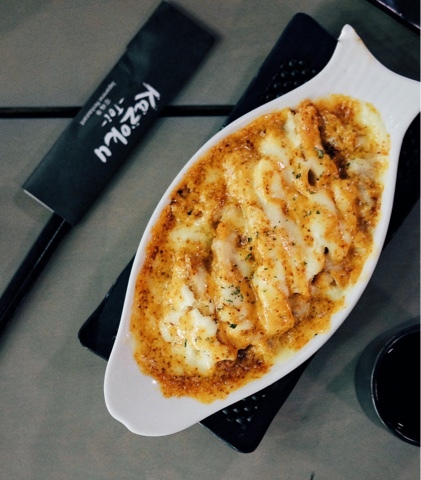 Kazoku Tei's chicken katsu don is one fulfilling donburi with tasty cuts of chicken katsu, egg, and generous rice. Happy tummy indeed! Generous portion of chicken teppanyaki come with veggies, tofu, rice, and miso soup. Teppanyaki come in good presentation, drooling enough to make me wanna try a bite. 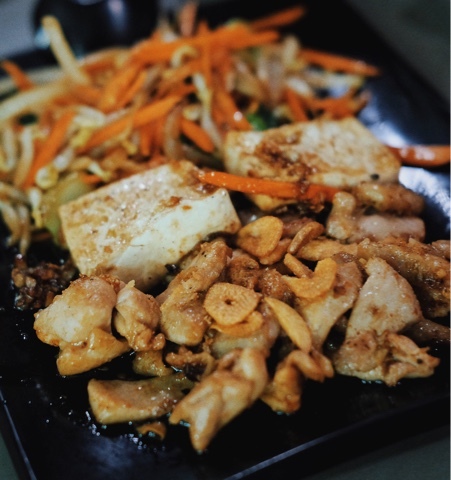 Chicken is flavorful and well seasoned, happy to have this one! Overall I have a satisfying dinner here. I have to say Kazoku Tei offer one proper Japanese food here in Sukabumi City. Generous portion, nice ambiance, affordable price. I would definitely come back to try another dishes! 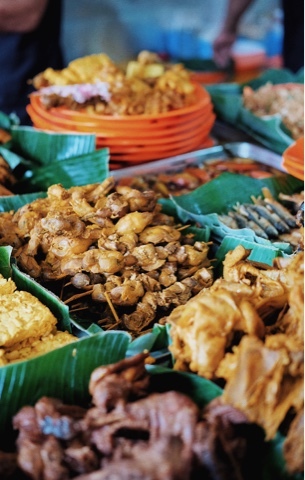 Things I like about living at Sukabumi: friendly people and pocket-friendly food. Finding food here is no effort, since local food and cafes are popping here and there. I have to admit that some days I just want to have this guilty pleasure by having fried food on my lunch (less guilty than having it for dinner), usually my craving for good fried food happens after one detoxing day with veggies and fruits. So, back to Alam Sunda. 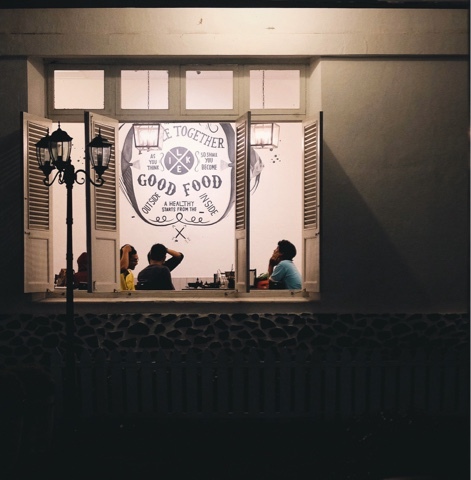 They are located in the busiest street of Ahmad Yani, 'chinatown' area of Sukabumi city. Funny that they have two stores here, aligned in the same side of road, separated by around 15 shops in between. I hear that both of the stores have the same quality so both of them are packed enough during lunch or dinner hour. System here is, you choose what you eat before you sit. Pick some foods, give it to the server, they're gonna fried it for you. 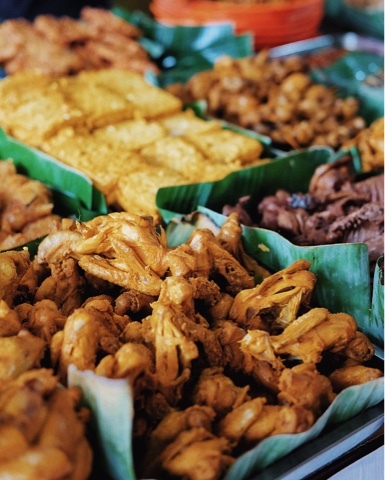 Fish, chicken, tempe, tahu, they have it all. Sundanese feast indeed! 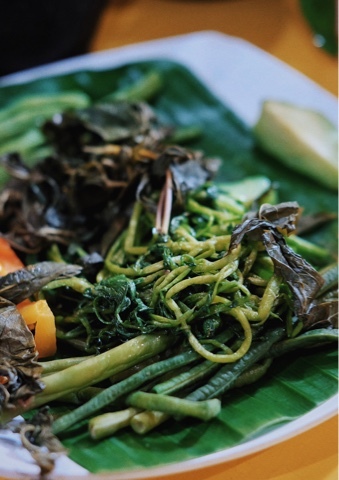 They also have some local soups like sayur asem, soto, and veggies like urap and kangkung. Price starts from IDR 10k-50k. 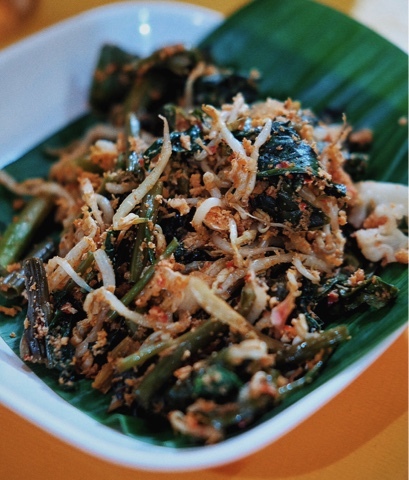 Good thing here, raw vegetables with sambal are unlimited and free. They have these two kinds of sambals and this sambal ijo is my favorite! I have to admit the umami flavor is really dominating but that's the thing that keep this palate alive, right! Fried food feast just get started! Lots of food, with bonus of crunch are their kind of serving style. Everything is tasty, giving it flavor of guilty pleasure. The food is kinda oily to be honest and I can't even finish the whole plate. Don't forget to drink a lot of water after those fried food! Overall Alam Sunda is not bad at all. Surely one of local favorite. I, don't think I will go back that often due to those fried food, since I am trying to have a healthier lifestyle here. 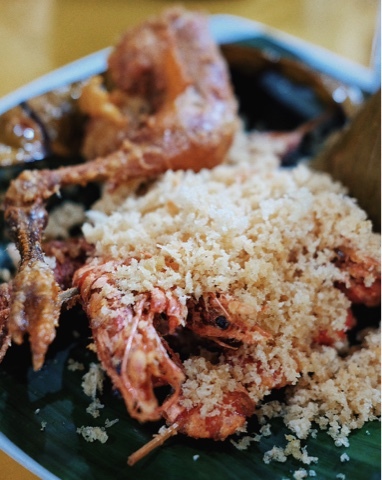 But for you who are a fan of local fried food, Alam Sunda is a place for you to go. 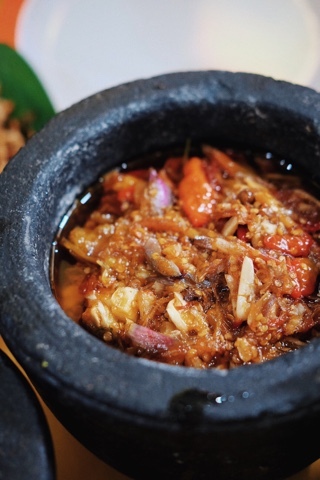 PS: their sambal is a must! One thing on my list when I am going back to Jakarta: visiting Beau HQ. I've read many reviews of Beau and I feel like familiar to the place just by reading at them. I know the natural light must be good. I know that they're having this Kinfolk ambiance. I know what's favorite and what's not. But still, I have to try it myself. 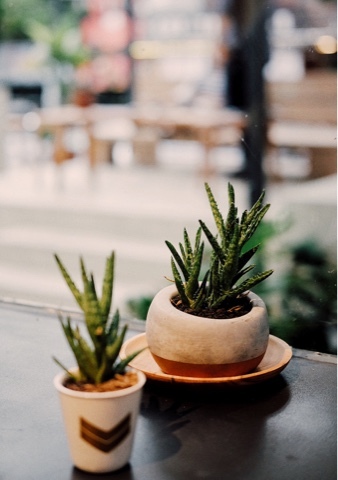 Beau HQ is located in Cikajang area, the 'it' spot at South Jakarta. Its open space is so pretty yet I really feel very welcomed on my first step inside. Everything is so elegant in white, making me consider to make it an inspiration to my future home. Can't decide which one is prettier, inside or outside, because both of them are lovely. Loving the shade of green they are using for the outdoor area. 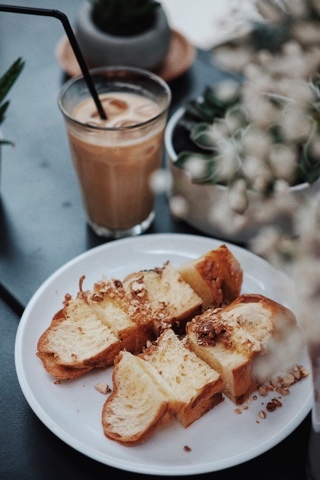 Imagine a lovely day with coffee and pastry at Beau. 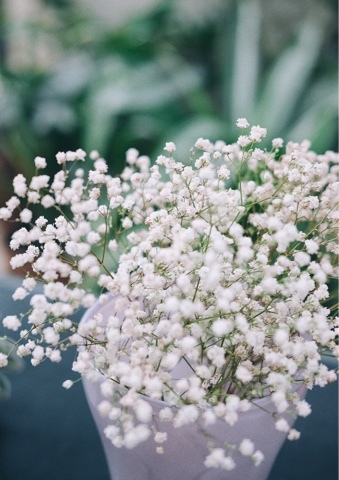 Enjoying the view at their big window, accompanied by these pretty baby breath. I have my personal favorite if we're talking about coffee shop and their coffee. Beau's iced latte is okay, but not the best I ever had. 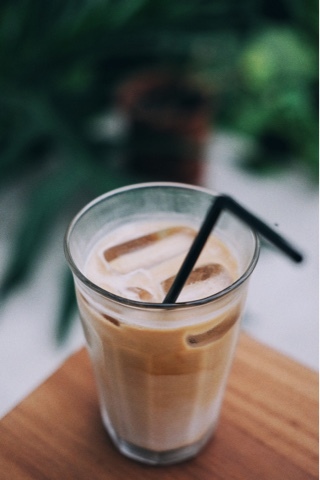 The weather is kinda hot that day and this iced latte turns put to be an enjoyable thirst quencher! Pastry on display. I am in heaven. 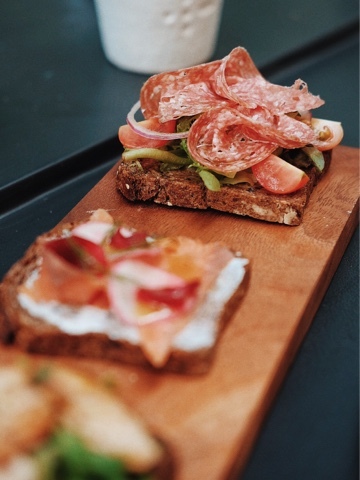 I have pork salami, gravad laks (salmon), and grilled chicken breast on my dark-rye bread. Actually I am not a fan of dark hard bread. I am more to a-fluffy-bread-person, warm fluffy bread to be exact. I personally like their grilled chicken best because of the generous and well seasoned filling. The salmon is quite a feast in my palate, too! While I find the pork bacon is just okay. 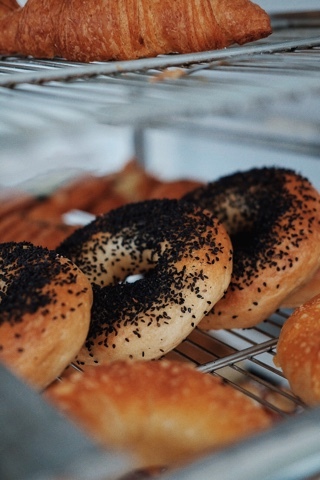 To be objective, their sourdough get along well with all the toppings, but still it is not my kind of bread. 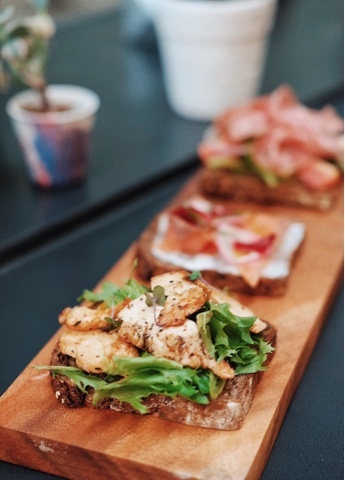 I think they actually have the option to go with their brioche for this open sandwich, but I do not notice it at first and the server do not ask for it too. Platter for sharing. Beautiful fresh ingredients on top. 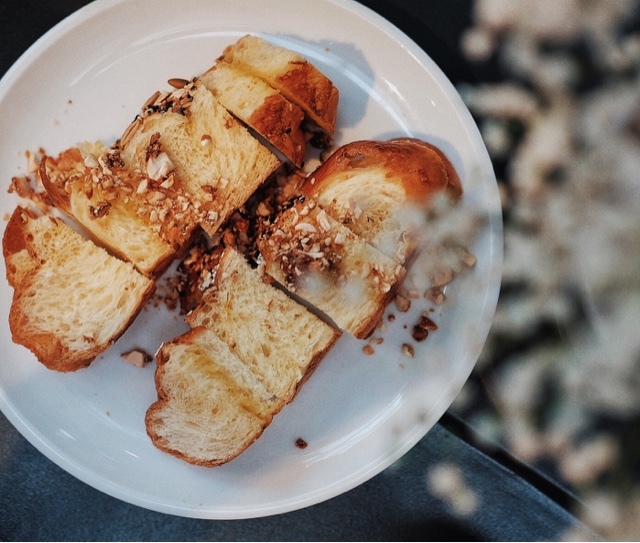 Basically it is a portion of their brioche with kaya jam. I am kinda hoping to have this one in more complicated way, because honestly having this is like having my breakfast at my home. I am such a sucker for bread and I have bread almost in every morning. However, the kaya jam is nice, not too generous, while the caramelized nut is really helping to make it merrier. Overall Beau is such a pretty place serving high quality pastry. Lovely place, quite palatable food, great ambiance, while the price is kinda high. I tried some of their pastry creation and totally in love with it. Here you can find some menus in more advanced way. Gonna come back to satisfy my pastry craving for sure!